Academics from around the UK have demonstrated against what they call a "miserly" pay offer. Hundreds of lecturers took part in a march to the headquarters of the Universities and Colleges Employers' Association (Ucea) in London. Academics have rejected Ucea's improved pay offer of 13.1% over three years. Higher Education Minister Bill Rammell said he was "extremely concerned", but the main lecturers' union said negotiations had to continue. Members of the University and College Union are boycotting the marking of coursework and exams, with some also refusing to set exam papers. The action threatens to disrupt thousands of graduations this summer. Ucea has increased its offer of a 12.6% pay rise over three years to 13.1% - but the UCU has rejected it, calling for 23%. It is warning that the marking boycott could escalate into strikes. Ucea's chief executive, Jocelyn Prudence, said: "We have come to the end of the road in the national negotiations. "We are very clear that we have moved quite a number of times. We really feel that we have done every thing possible to accommodate the unions' requests." 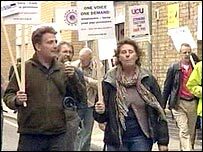 But UCU joint general secretary Sally Hunt said: "It is only the end of the road for national bargaining if the employers refuse to negotiate." Mr Rammell said: "I am extremely concerned at the impact of this dispute on students, and I strongly urge the unions to put this to their members." Meanwhile, University of Kent students, concerned at the possible disruption to graduations, held a march at the Canterbury campus on Thursday. Student union president Emma Powell said: "We don't want to be used as leverage anymore. "We do support the [union's] demands for better pay but we just want our marks."